Women in BJJ may also be mothers in BJJ. While parenthood has implications for both mothers and fathers in BJJ, the processes of pregnancy, birth and recovery in the first year have particular implications for mothers. You can see the different ways motherhood can impact a woman’s training by checking out the Facebook Group, BJJ Mums, where mothers in BJJ share stories, challenges and insights into training pre- and post-natal. It is clear from threads here and lived experience among other new moms that – unsurprisingly – recovery after birth varies from one individual to the next. Some women seem to drop the weight immediately, some hold on to it for dear life, some integrate core-boosting exercise into their routines, such as yoga and Pilates, while others hit the weights, power walk with their prams, some are straight back to training with the baby sleeping on the sidelines, some are slower to get back on the mats. So, my journey is just that, my own, and it may or may not reflect the experiences of others, but I do hope that chronicaling some aspects of my experience will be helpful to other athletic women contemplating their first pregnancy, or wondering how to get back to feeling good. Hmm, well after 12 months I’m not there – back to feeling good that is – we’ve had a very exciting year and the little guy is a pleasure to have around, to adapt to, and to nurture. However, as any parent can tell you, he is the focus, and with primary responsibility for childcare there’s limited bandwidth left for running our business, much less for self care. That said, as little man grows there’s more and more opportunity to make space for what I need to do beyond mommy-duties. There’s been a lot of changes in my life, including when and where I train. When possible, I hit my long-time instructor, Dave Birkett’s, Friday class which is a short commute to Ilford. My attendance is sporadic as it requires my hubby’s work from home day to land on a Friday, which isn’t always possible. Other than Fridays, there’s no chance, at the moment, for me to make the commute to Kent in time for classes with the club I grew up with, Dartford BJJ. This is a serious bummer, as I miss training with those guys and working with Dave. One must solutionise, however, and happily my training partner, Jon Hegan, is a Royce Gracie BJJ affiliate and runs a Wednesday class in easier reach, in Upminster, which starts at a time more practical for me in terms of handing off childcare to my hubs. I never imagined I would train with anyone but Dave and the guys, but I’m really grateful to Jon and his crew for taking me in on a part-time basis and it is brilliant training with them. From the time little dude was 9 months old, I’ve been reintegrating (sort of) regular weekly training back into my routine, hitting Wednesdays and or Fridays whenever practical. Integrating activity into my lifestyle – beyond daily walks with the buggy – has gotten a lot easier more recently for three reasons: 1) little person sleeps pretty reliably; 2) little boy weaned himself at 11.5 months; 3) I’m investing in personal training. Though little mister had only been enjoying a light morning feed since about 10.5 months, having dropped all others of his own volition, it wasn’t until the complete end of breastfeeding that I realised how fatiguing the creation of breast milk is, even just a wee bit! Though my energy levels are still lower than I’d like, within the context of reasonable sleep, I felt immediately that there was more in the tank once we were done with that chapter. Personal training was really important to my ante-natal fitness and it is proving to be a big help, post-partum. With my schedule and my poor energy levels and just feeling so heavy and weak – working out is so much more fun when you’re fit! – I’ve found that having an appointment with a trainer helps me get to the gym and get the most out of it. Twice weekly I get together with my trainer and we work the kettlebells and a selection of core exercises. She’s reasonably merciless, which is great, and I’m definitely getting stronger and our work together is helping to improve my movement when I’m able to get to BJJ. Finally, it turns out I’m not one of those ladies that seems to magically shrink back down to size during breastfeeding. The baby weight hasn’t really gone anywhere, in spite of gym work, watching my diet, and daily activity. I’d hoped to be much closer to pre-baby fitness by this stage and am at the start of a 12 week sprint of exercise and mega clean eating, undertaken in concert with my husband. Hoping that as the hormones have worked their way out of my system and my cycle is back online, with a little more sleep, and a little more conviction that I can be more tolerably fit this calendar year, I’ll have made some good progress on the fat stores by the end of this 12 week phase and then a new set of goals will be appropriate. My little man will make 12 months in September, and except for the weaning part, I identify with you completely. We even have the same haircut. Hi Lori, haha! It is a good ‘mom haircut’ that can handle the mats too 😉 Congrats on your baby boy and happy birthday to him this autumn! Meg, thank you thank you thank you!!! I am pregnant with my first baby and the pregnancy has taken over my life – I thought that sheer will and perseverance (things we learn in BJJ) would allow me to stay energized, athletic, and endure these 9/10 months as though the pregnancy would succumb to my will. Around the 6th week of pregnancy and even now at 25 weeks, I have learned that I am not the boss of me. This little girl in my womb is the boss of me and will be for the immediate future. I am exhausted, I hurt, I can’t breathe, eating isn’t fun, and who’s body has taken over?! In the BJJ community, people have mentioned to me the woman who trained until she was like 8 months pregnant, and women who went back to training several times a week after 3-6 months. And all I can think is how will I be able to work 40-50 hours a week, spend time with my girl, have time for my husband, and train? Especially because training BJJ isn’t like going to the gym, you have to do it on a schedule. Before baby, I lived my life to the BJJ class schedule and I know I won’t have the luxury going forward. And as much as I LOVE BJJ and Muay Thai, and I know you know what I mean by the word “LOVE”, I feel that it is naive and dangerous for me to dream of returning to the training experience I had pre-baby anytime soon. And I know that I won’t be as effective on the mats when I return, my timing will be off, I’ll forget transitions, I won’t be as strong, and getting injured doesn’t impact just me anymore, it impacts my family. Reading your story I feel like, finally!! !, Here is someone who isn’t saying it is going to be magical… That it isn’t going to be a power of the minds. Rather your life and body will be different and I call that the “Honest Truth”. We are all different and what we go trough is completely unique. But you said it, even one day of training whenever you can get it is going to be worth it. Thanks again Meg! Thank you so much for your comments, which give me heart, too. I hear you so much about feeling like you’re body has been hijacked! I found that feeling got even worse by 33ish weeks when I was getting so huge; even a year on it still feels nice to be able to lay on my back. I think that might be a particularly annoying part of pregnancy for athletic women who have such great body-awareness. Even though all sorts of stuff is going on after the birth, I immediately felt more comfortable and in greater ownership of my body, so there’s light on the horizon! Yup, pre-baby, it was possible to make that balance between work, home and training. Put the baby in the equation, and that all goes haywire. Sure, some folk can swing it – and I do hope you’ve got some good support around, as it is tough going with no family local – but I’ve found it to be very problematic in all sorts of ways. Of course, when BJJ has to take a back seat, fitness does too and it is one hell of a mountain to climb, especially as your core will take such a beating and that’s so key to BJJ. It’ll happen, but it takes a lot of ‘expectation modification’. The cool thing is, the little person is pretty amazing to have around and they are small for such a short time that, in the medium to longer term, they are going to be wanting to do lots of other things aside from hang out with mom. So, I figure, while the BJJ thing is a bit of a bummer at the moment, it is still awfully good to go to one class a week. It is the main time I can completely focus on something else with no background mind cycles on the baby, and that’s real important for my wellbeing. Soon enough, mom’s role will be less and less central and so doing my best to be ‘in the now’ and enjoy these special, special times. Just wish I didn’t feel so dang weak all the time! PT is expensive, but is seriously worth it in terms of making the most of workout time. Not only is there limited self-care time (enjoy luxurious showers while you can! ), I’m loathe to miss time with the whole family. It is a lot to juggle, and is a tough transition, but I find it helps to remember that I didn’t get to my purple belt in a day, and over the next few years I’ll have more and more chances to regain my skills and make BJJ a bigger part of my life again. It would be helpful if there were more varied timetables at BJJ places, though, daytime classes when kids are at nursery/school and etc, but I fully appreciate that BJJ businesses need to make a living and the vast majority of students aren’t women/moms, at least ’round these parts. One thing that has been weighing on me a little, and you sort of touch on it, is the expectation among some folk you might train with that new moms should prioritise BJJ to the same degree as before the arrival of the little one. That may well work for some, but there’s a lot of factors such as work, support network, childcare, ensuring quality family time and so forth, that may not make that sensible. Most folk have been pretty sensitive and patient, so far, but do sometimes feel my ‘commitment’ is questioned. Fair enough, my commitment to BJJ *is* different, damned straight, and in my opinion, right here and right now, that is correct for me and my family. That’s not to suggest women who get back in there more fully and quickly are neglecting anything, just that they have a different set of factors that makes that approach more practical for them. Still mega important for me to be active and get healthy, so I do what I can to keep BJJ and the gym in the mix, but we’re talking about 4 hours gym and BJJ a week versus the 10-12 I was doing pre-baby. I am not sure if you meant me when you talked about a women who trained up to 7th month and was quickly back to the mat after giving birth. Probably yes. Anyway, I did so I felt I had to answer the post. 5) I adjusted my whole work times and baby times to the training time, so that first I get my training done and then everything else. As long she was a baby, it doesn’t matter if she slept in the carry-cot while I was training or in her bed. At least on my opinion. Now that she goes to kindergarten and has to go early to bed, I go to early classes. Wow, Ana! What a great support infrastructure you have. Fantastic to have so much flexibility in your commitments to allow BJJ to stay so central while taking care of your littles and working and everything else! Thanks for sharing. This was a really inspiring article. My wife is pregnant so I’m definitely go to have her read this. We are also concerned about finding time to do anything after the baby comes and it was interesting to see how you are coping with being so busy. I am new to JiuJitsu, though my 10-yo daughter has been practicing for about a year. I’m a 37-yo mother of three kids, ages 10, 8, and 6. I have a pretty strong background in athletics, and have participated in olympic-style weightlifting for the past two years along with my new interest in BJJ. 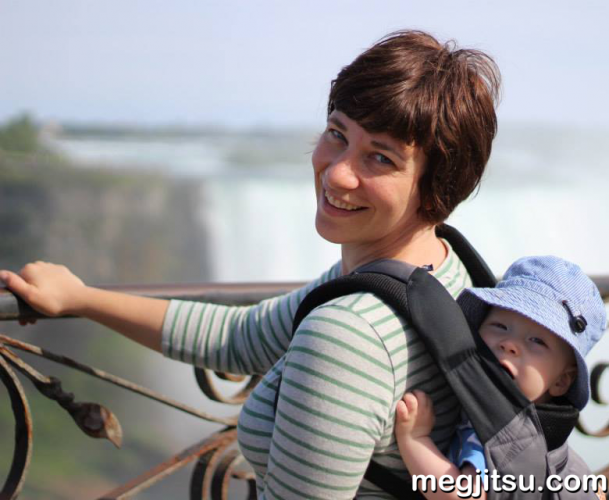 I know it won’t sound encouraging to hear that I am just now getting to put time into BJJ, which I have been interested in for at least 8 years, but I have had to make choices about how to apply my free time, as everyone does–especially mothers. But, I do want to throw in an encouraging voice to say that the time goes fast, and that you WILL be able to find time for the things that you value the most, even if you need to limp along for a few years. When my youngest was three, I realized I was over the baby hump, and started auditing evening art classes at my local university. This was the time that I realized that it was time to claim space back for myself, and I have been very able to accommodate at least one hobby at a time since then. At this point, my whole family is studying BJJ. My kids take their classes, followed by my husband and I. Then, he and I switch off for a few extra classes each week, and we also get my oldest to an extra class or two. It has been really fun to have a shared interest, and we all love to show each other the moves we’ve been learning in class (assuming they are appropriate for age/skill levels). It is really exciting to see out family begin to move into the next phase–the one where I’m not needed for everything for them, and we can share our excitement and learning. I don’t know if this will be reassuring or not, but remember that like is (usually) long, and you will be more free again in the near future. I am really enjoying reading your blog, thank you!